The United Arab Emirates plans to introduce robot riders this year, newspapers said on Sunday. 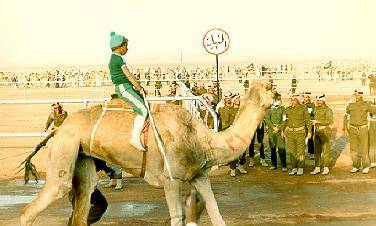 “The mechanical jockey is light in weight and receives orders from the instructor by a remote control system fixed on the back of the camel,” said the daily Gulf News, quoting an official statement. The daily said that President Sheikh Khalifa bin Zayed al-Nahayan was behind the initiative. The Gulf Arab state last month enacted new laws to crack down on the trafficking of under-16 camel jockeys, a practice internationally condemned as a form of slavery.